In Connecticut, nursing home abuse is a rampant problem. 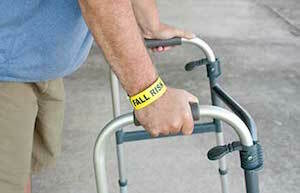 It is becoming more and more difficult for family members to find a caring nursing home facility for their loved ones. According to a research study conducted by the University of California-San Francisco, there were only three percent of nursing homes that contained no deficiencies in 2008. This means that 97 percent of all nursing homes in Connecticut have serious problems in regards to understaffing, nursing home abuse and neglect of residents. Family members must keep close watch of loved ones who are currently in nursing homes in Connecticut, because it is likely that there are deficiencies in that particular facility. 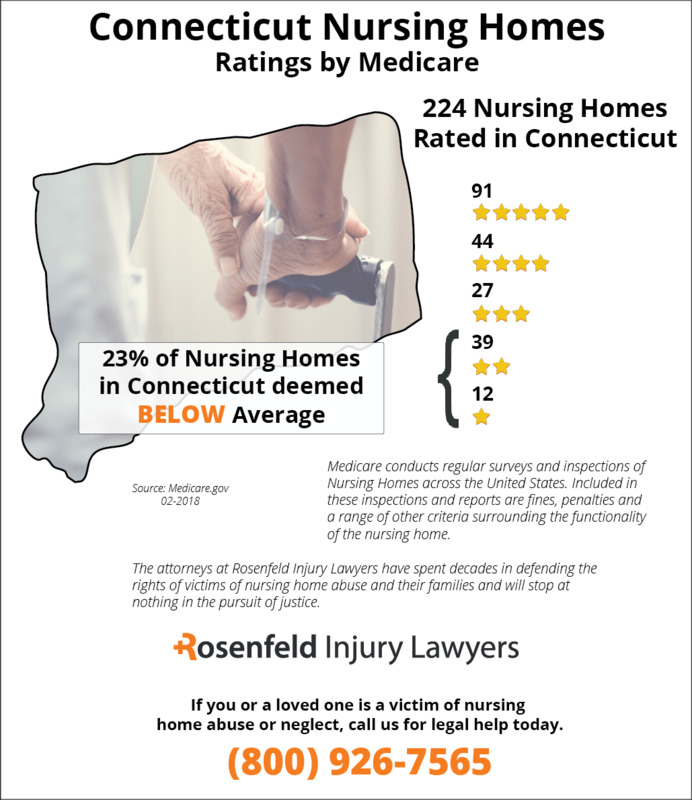 Throughout the year, Medicare routinely inspect and surveys every Connecticut nursing home to identify violations and deficiencies that lead to substandard care. 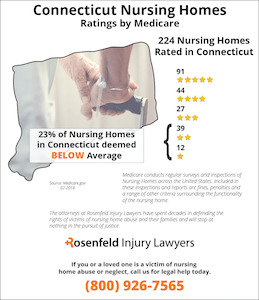 Currently, fifty-one (23%) of the 224 nursing facilities rated in Connecticut are deemed to be below the national average after investigators determined the nursing staff provide substandard care. If your loved one was mistreated, neglected, abused, or died unexpectedly from substandard care while living in a Connecticut nursing facility, we encourage you to contact the Connecticut nursing home abuse & neglect lawyers at Nursing Home Law Center to discuss a claim for compensation during a free case review. Even more tragic, statistics from the UCSF research study indicate that 39 percent of all nursing home residents were the victims of actual harm and abuse in 2008. This is a very high number in comparison with other states, and family members must be aware of the health condition of a loved one in a nursing home at all times. A nursing home attorney can help family members end the abusive treatment and take an assertive role in protecting the legal rights of a loved one. If you suspect that a loved one is the victim of nursing home abuse, then you can report nursing home abuse in Connecticut and speak with a nursing home lawyer who will help you. Family members should be aware that they only have 2 years to file an action for injury to a loved one. The Connecticut Statute of Limitations begins to run from the date in which one first discovers the injuries on a loved one. There is no damages cap for actions involving injuries caused by professional negligence. In addition, family members may also wish to consider filing a wrongful death claim for abuse or neglect that has resulted in the tragic loss of a loved one. In Connecticut, a wrongful death claim may be filed within 2 years from the date of death. There is also no damages cap for wrongful death actions. Nursing home abuse is a serious situation for any family member to deal with, and protections for Connecticut nursing home residents been codified into law as a result. Chapter 319dd is the governing authority for protective services of the elderly, and it maintains that any suspicion of abuse, neglect, exploitation or abandonment must be reported to protective services. This means that family members must report any suspicions of abuse or neglect that they may have, and it also binds nursing home professionals to reporting these suspicions as well. Nurses, medical examiners, any nursing home staff person and physical therapists all have a legal obligation to report any suspicions of abuse or neglect that they may have. Under Connecticut laws, the failure to report any signs of this abuse results in a class C misdemeanor for a first offense or class A misdemeanor for subsequent offenses. When abuse is reported, the regional ombudsmen’s office will investigate an abuse report. Call a Connecticut nursing home attorney to receive the help that you need to file a legal claim. Residents of a nursing facility confined to their bed or wheelchair have an increased potential of developing a decubitus ulcer (bedsore; pressure sore; pressure ulcer). If the condition is not treated effectively and promptly, it can cause permanent damage or a fatal infection. Decubitus ulcers usually develop when bedridden or wheelchair-bound patients remain in one position for an extended time. The condition is the result of pressure on the skin that limits the amount of blood flow to the area. When the skin is deprived oxygen after just a couple of hours, it can become damaged, inflamed, reddened and even die. Unfortunately, bedsores are a common problem in nursing homes due to understaffing and insufficient training of the nurses and nurses’ aides at the facility. Many times, nurses tend to focus on the resident’s primary health condition and do not monitor the patient’s skin properly to detect any decubitus ulcer in its early stage. Many nursing facilities put profitability of the nursing facility ahead of providing quality care to patients around-the-clock. However, developing and implementing an effective health plan for every bedridden patient could improve the quality of their well-being. Routine repositioning of immobile patients could eliminate nearly every incident of bedsore development in the facility. Relieving the pressure on the skin at the site of an existing decubitus ulcer could provide oxygen-rich blood to damaged tissue to encourage healing. What Families Can Do When Their Loved Has Acquired a Pressure Ulcer During an Admission to a Connecticut Facility? In all likelihood, you placed your loved one in a nursing facility because the family was unable to provide proper health care to assist in their ailment, illness, disability or medical condition. You likely believed that your loved one would be treated with dignity in a loving environment while under the care of experience nursing staff. You probably thought that the nursing home would develop an effective plan to maintain your loved one’s health, and implement the plan with competent, well-trained medical staff. If you suspect your loved one is suffering serious harm from a bedsore, or died from negligent care of an existing pressure sore, you can likely file a malpractice claim. A claim for compensation can provide you peace of mind knowing that the negligent actions of the medical staff will stop immediately and save other patients in the facility from the same mistreatment. 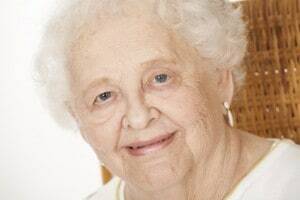 If your loved one is suffering from a bedsore, a skilled Connecticut decubitus ulcer lawyer can take legal action to stop the neglect by the nursing home staff immediately. The law firm can build a solid claim for financial recompense to cover expenses including the cost of medical care provided by professionals who specialize in treating decubitus ulcers. The professionals provide at Nursing Home Law Center LLC offer a no obligation free consultation to discuss a malpractice claim. They accept cases on contingency, which means the family is not required to pay any upfront fees.